Has the Talk about Mental Illness regarding recent shootings over? It is sad that it takes a tragedy like the one at Sandy Hook Elementary to get people talking about mental illness. What is even sadder is that even though the media and politicians have voiced concern over how our nation needs to do something about mental illness, nothing really is being done. 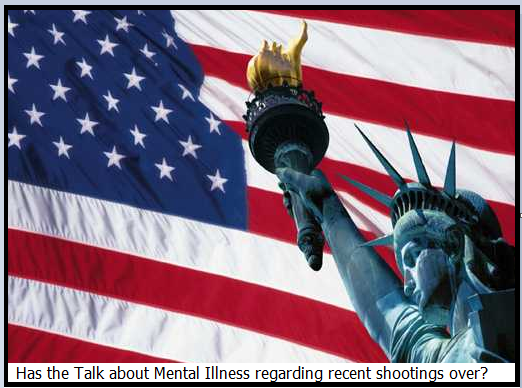 It seems like everyone has gone back to living life and forgotten, once again, that we have a serious problem in the United States regarding how we treat people with mental illnesses. President Obama’s ideas of how to change things in regards to mental illness is a start, but nowhere near what we need to do. Starting programs to help children and training teachers is just not enough. Those people with mental illnesses know the problems that we face and yet most politicians and the media don’t want to hear from us. I don’t know if it is because they think we are just crazy people ranting or that they are afraid to respond because they are afraid they might say the wrong thing. The fact is, that we need to do something now and who better to ask about how the broken mental illness system in the United States is broken. There are not enough beds in psychiatric hospitals so oftentimes people who need help are turned away. The amount of psychiatrists is dwindling and therefore, it can take months before you can see a doctor. If someone is in crisis, they need help now.. They can’t wait until there is a bed open or a doctor who can see them. There needs to be more outpatient facilities for people who need help. Steps need to be taken to help erase the stigma & raise awareness. Educating people about what to look for, how to find help, what to do if someone you suspect someone you know is a danger to themselves or others are all important. Also, making people aware that a mental illness is not a flaw and not something to be ashamed of. In many cases it is a chemical imbalance that people are born with. People should not have to hide that they have a mental illness because they fear they could lose their jobs or friends. If you have cancer or diabetes, it is ok to tell people. However, if you have a mental illness, most people feel they have to hide it. That is just not right. Because of this fear and the stigma attached to mental illness, people who should be asking for help, don’t get it. It seems like after tragic events happen where the shooter has a mental illness is the only time the topic of mental illness is discussed. People like to call people who have mental illnesses crazy. However, in my opinion, waiting for another tragedy to happen before we start talking about mental illness is crazy! In October, there is a week set aside called Mental Illness Awareness Week. Last year, I sent emails, tweeted, and posted messages on FB regarding the importance for people to spread the word about this week. After contacting hundreds of people with influence (media, actors, musicians, politicians, athletes, etc.) I only heard back from a handful of people. 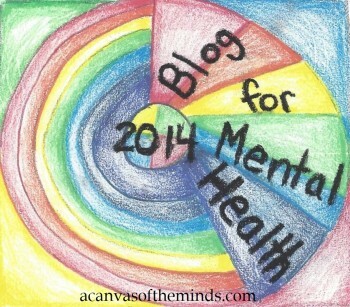 My hopes is this year, more people take advantage of this week to spread the word about mental illnesses. Please sign a petition asking our politicians to make sure that Mental Illness Awareness week is observed in 2013. Please side note. Here is the petition: Please sign it and share it with people you know who are advocates and/or have a mental illness. This entry was posted in Uncategorized and tagged advocates, advocates for people with mental illness, gun control, gun control and mental illness, media on mental illness, mental illness, mental illness awareness week, nami, Obama on mental illness, p, politicians, President Obama, problems mentally ill face, psychiatric beds, psychiatry, Sandy Hook Elementary, shootings, stigma, tragedy. Bookmark the permalink. 1 Response to Has the Talk about Mental Illness regarding recent shootings over?